Francis "Frank" Anthony Koenigsman was born December 9, 1926 at the family farm built by his Grandfather Anton Koenigsman four miles due east of Tipton, Mitchell County, Kansas. He was the first of Edward Baptist and Veronica Susan (Lutgen) Koenigsman’s twelve children, nine of whom survived to adulthood. 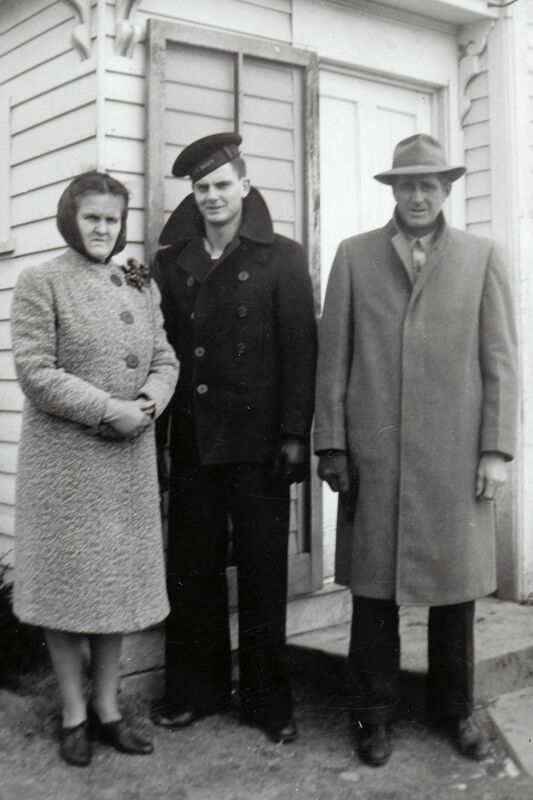 Frank grew up during the Great Depression, attended School and St. Boniface Catholic Church in Tipton, graduating early from high school in December, 1944 so he could join the war effort. After the war, Frank took advantage of the G.I. Bill and attended Business College in Grand Island, Hall County, Nebraska, where he met beautiful Theresa JoAnn Stobbe. JoAnn told the story that she often went to local dances with her older sisters since she was only 17 and when she first saw Frank, she said "he's the one". She was right. They married on November 17, 1947 and together raised six children. Frank passed away on December 16, 2004 and JoAnn followed less than a year later on November 1, 2005. 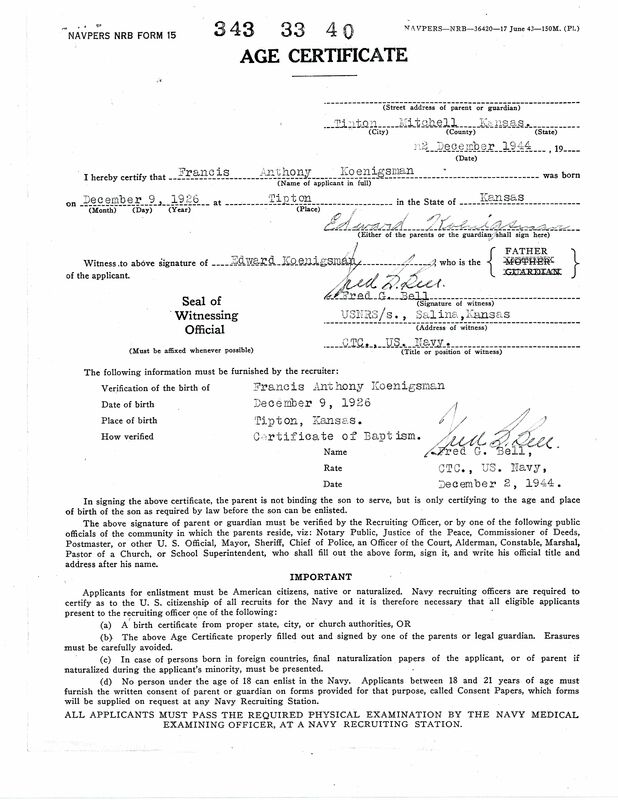 Frank filled out his Application for Enlistment to the U.S. Navy on Saturday, December 2, 1944 at the U.S. 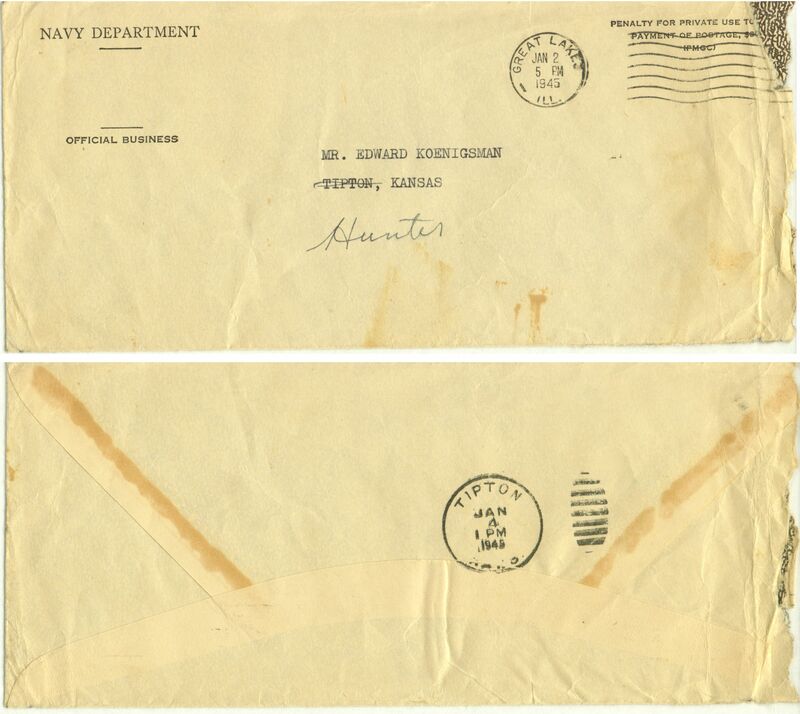 Naval Recruiting Station (USNRS/s.) in Salina, Saline County, Kansas and then travelled to the USNRS at Kansas City, Jackson County, Missouri on December 4th where he officially entered into Active Service in the U.S. 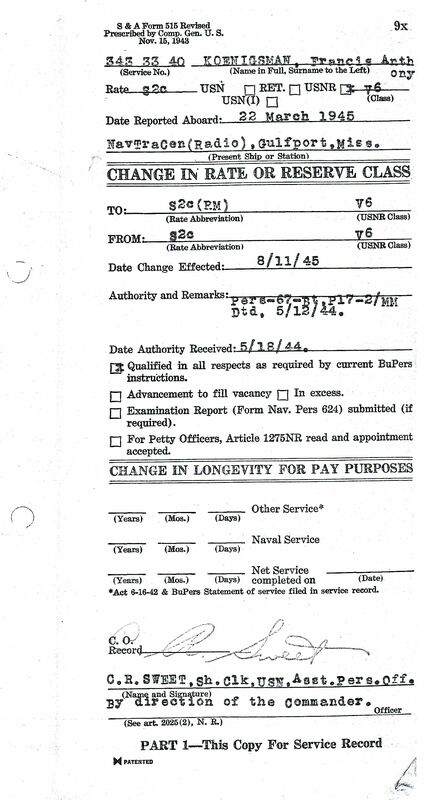 Naval Reserve (USNR, V-6) with the rate of Apprentice Seaman (AS). 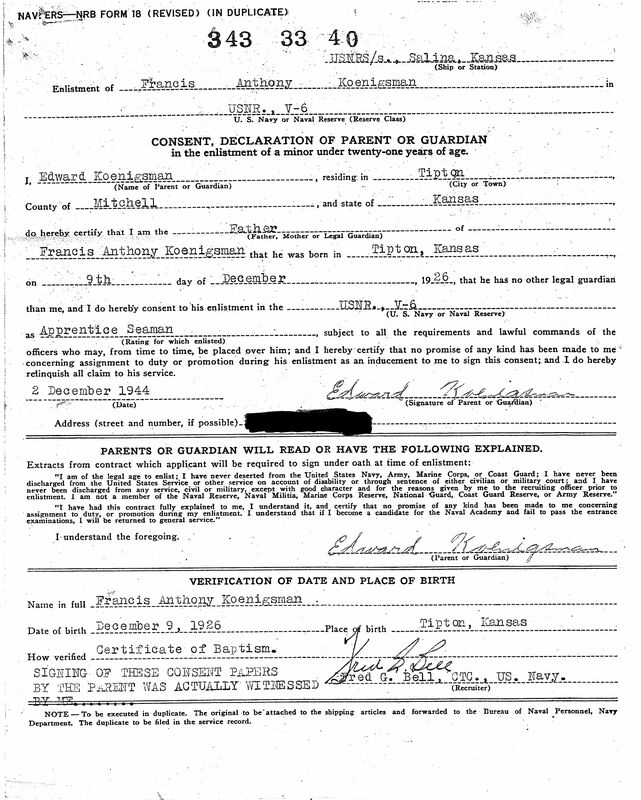 Since this was just before his 18th birthday, his father Edward had to accompany Frank to Salina to sign an Age Certificate and Parent Consent form. 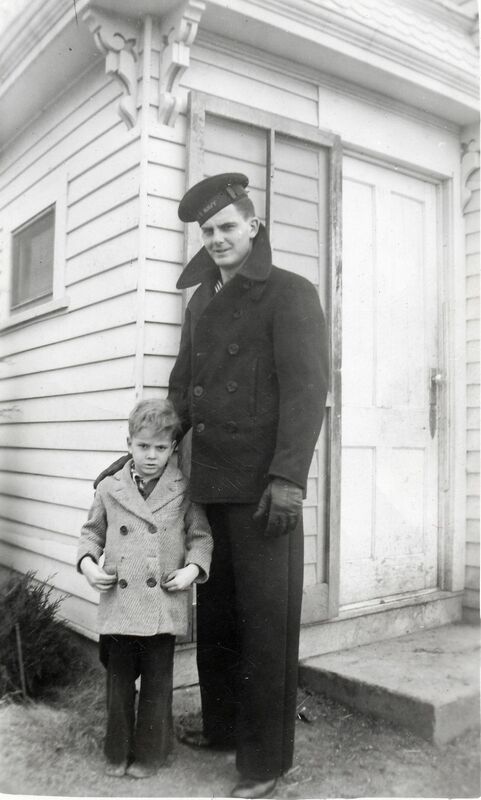 Just two days after enlisting, Frank was in Great Lakes, Lake County, Illinois on December 6, 1944 attending Basic Recruit Training at the U.S. Naval Training Center (USNTC). 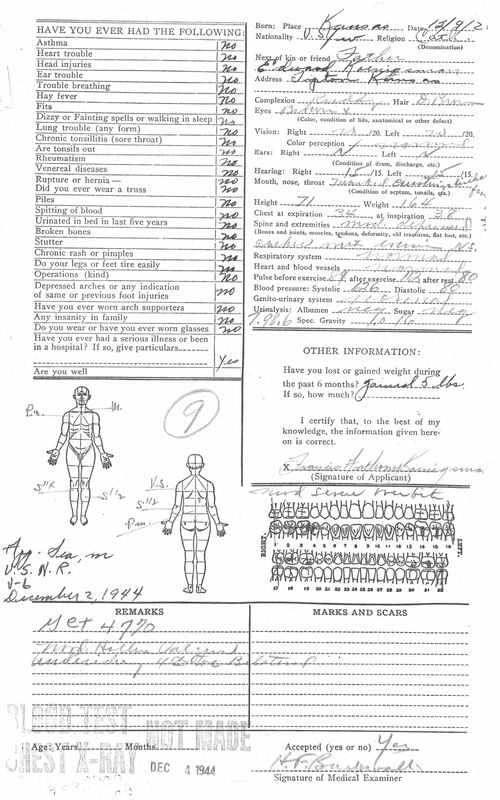 Within a month of his arrival at the USNTC, Frank contracted scarlet fever and was admitted to the McIntire Dispensary on January 1, 1945. 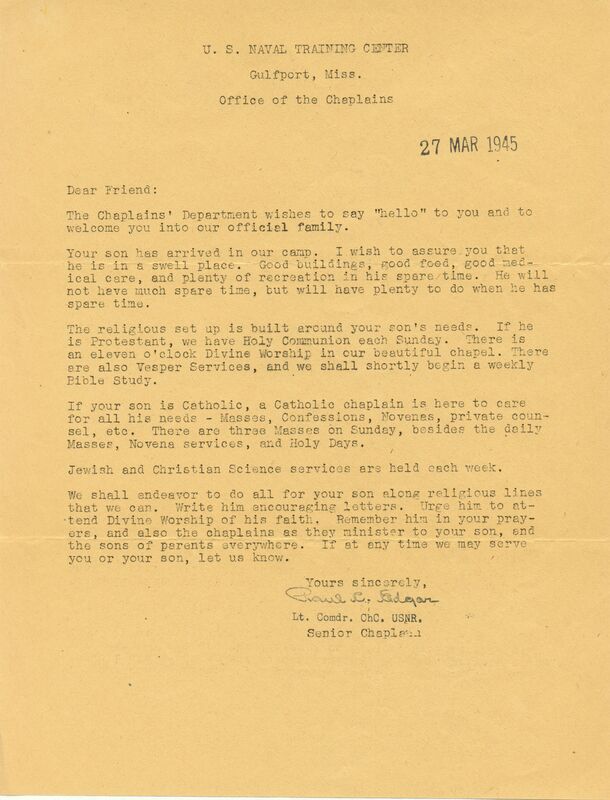 The following letter was sent to his folks to inform them of his illness, and request they not come to see him while he is sick, since he will not be allowed visitors. During Basic, Frank received a course in Fire Fighting and also qualified as Rifle Marksman. 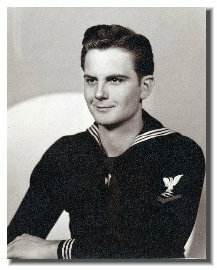 On Saturday, February 24th, 1945, Frank graduated Basic Recruit Training and was promoted to rate Seaman 2nd Class (S2C). 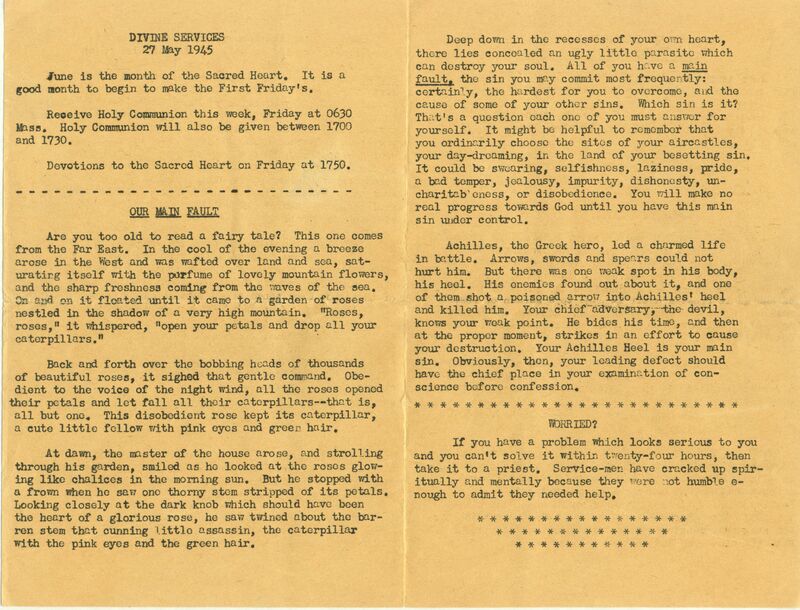 The U.S. Navy publication "The Bluejackets' Manual", issued to all naval personnel, describes the duties of a Seaman as "Know naval drill duties, knots, steering and signaling. Stand watch and gunnery duties." 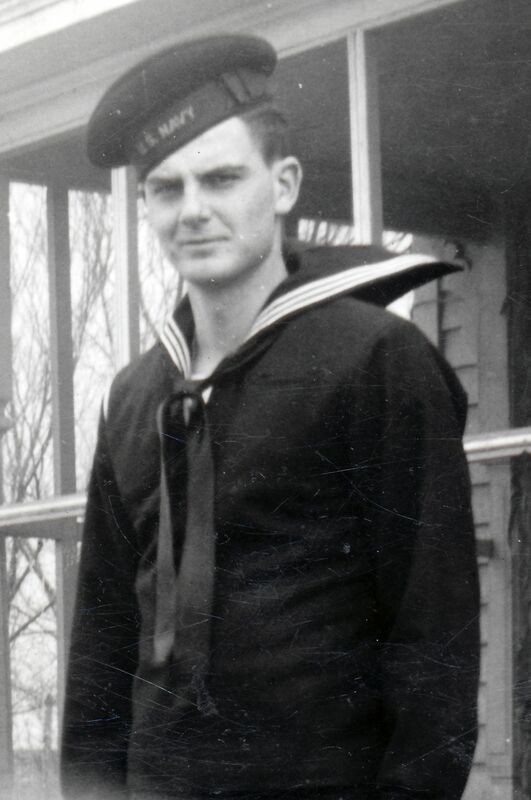 According to the website "Summary of Ranks and Rates of the U.S. Navy" and the "The Bluejackets' Manual", Frank’s monthly pay increased from $50/month as an Apprentice Seaman (Grade 7) to $54/month at the S2C rate (Grade 6). 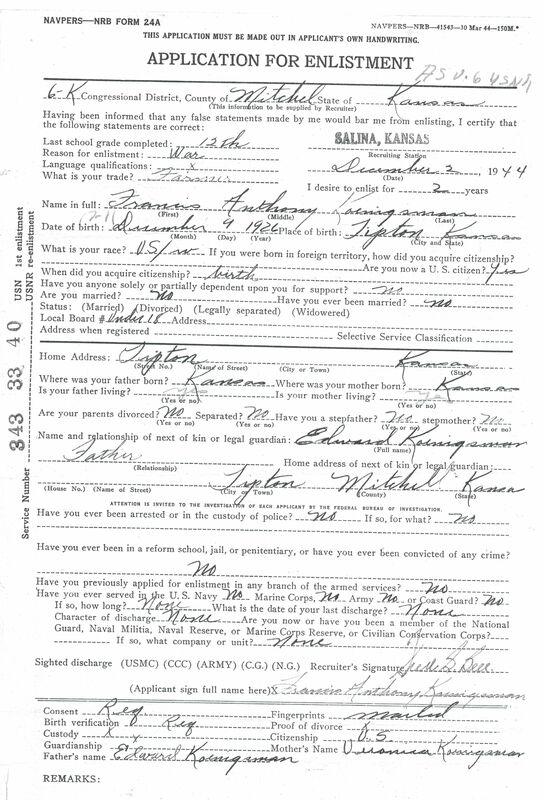 Upon graduation, Frank was awarded 11 days Recruit leave (Feb 24 to Mar 7, 1945) and probably traveled back home to Kansas for a short visit. 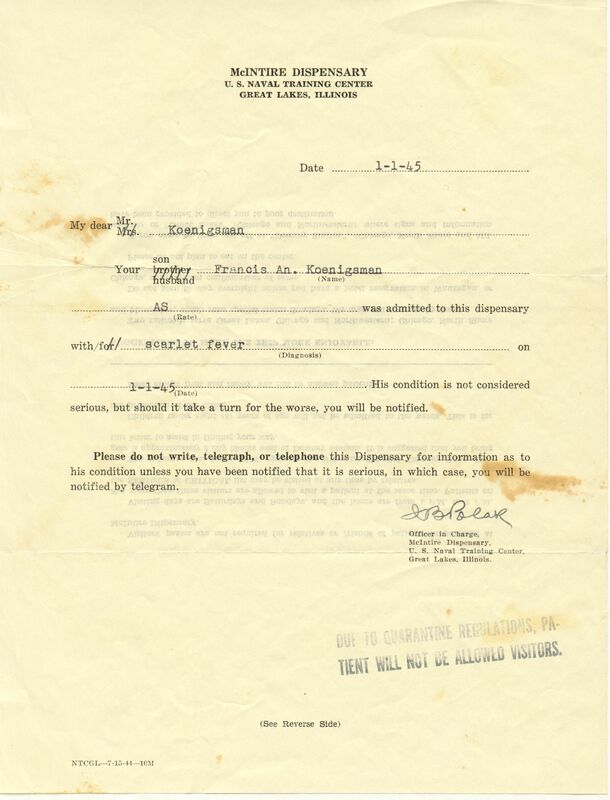 On March 21, 1945, Frank received orders transferring him to the U.S. Naval Training School (NAVTRASCOL) at the U.S. 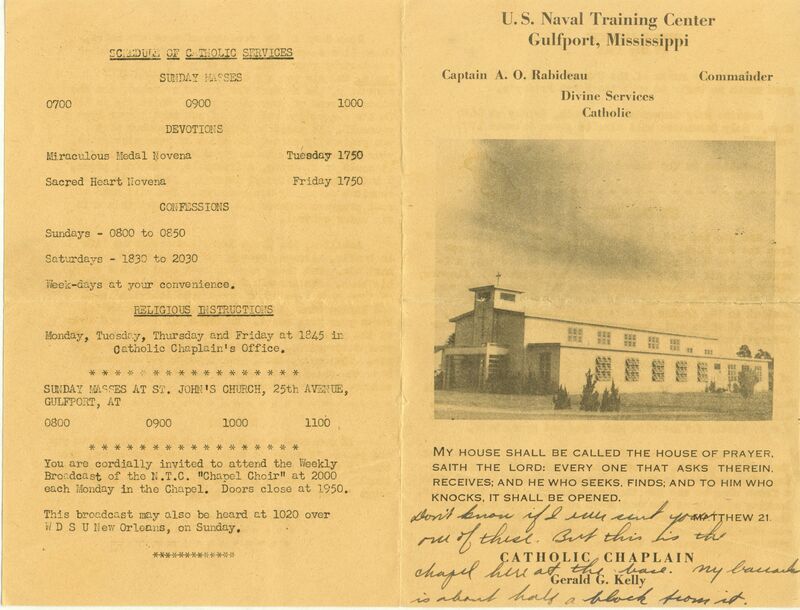 Naval Training Center in Gulfport, Harrison County, Mississippi (now the "Naval Construction Battalion Center Gulfport") for a Radioman Course of Instruction. 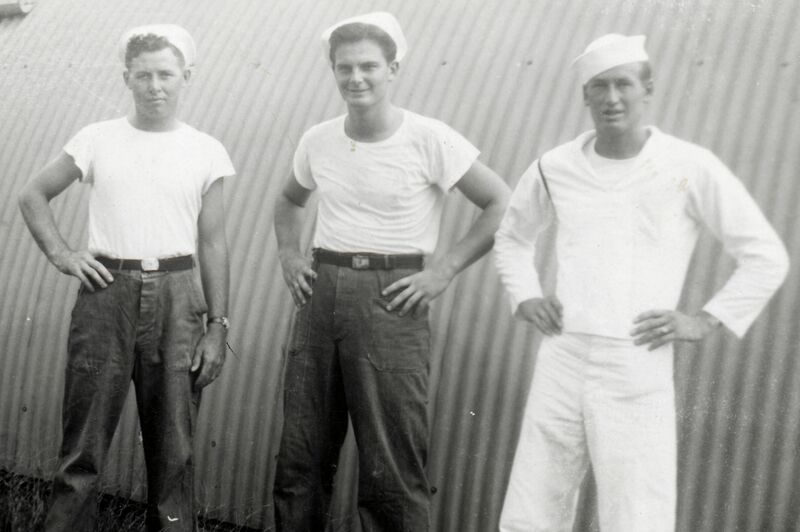 Frank arrived on Thursday, March 22, 1945 to begin his 20 week of training. 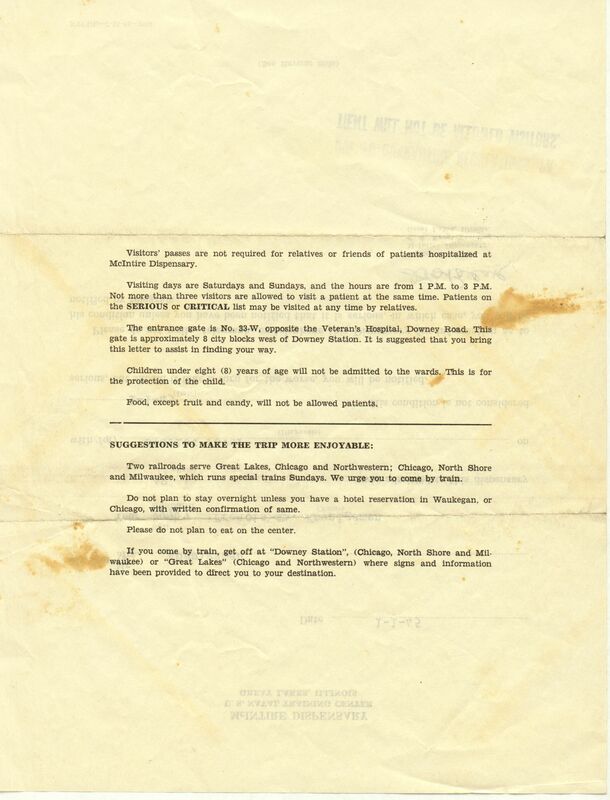 "The Bluejackets' Manual" states a Radioman's duties are "Transmit and receive radio messages. Encipher and decipher messages." Frank's World War II Naval service, based primarily upon his naval records and other historical research. Items in black or blue boxes and text refer to information gleaned primarily from Frank's records. Information in green boxes with green text is provided for historical context, and has been research separately. 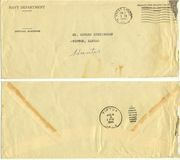 Documents and images within the green boxes are not part of Frank's heritage and have been acquired through other sources, primarily the Internet. MINIMUM TEST SCORES: GCT 50; SPELL 50; CLER 50; RADIO* 55. PHYSICAL: Hearing in each ear must be 15/15 by whispered voice. Ears free from disease. Manual dexterity. PERSONAL: No older than 28, unless experienced in code reception. MISCELLANEOUS: Hobby as "Ham Operator," if code work included. Knowledge of typing desirable. H.S. experience desirable. DUTIES: Sends and receives encrypted (codes and ciphers) and plain-language messages by radio. 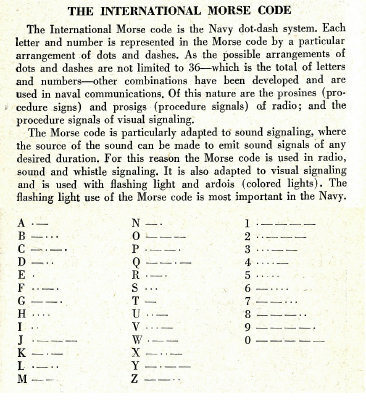 Receives messages in Morse code through earphones and records them by typewriter. Transmits with a telegraph key or microphone. May be required to make simple emergency repairs to receivers and transmitters. 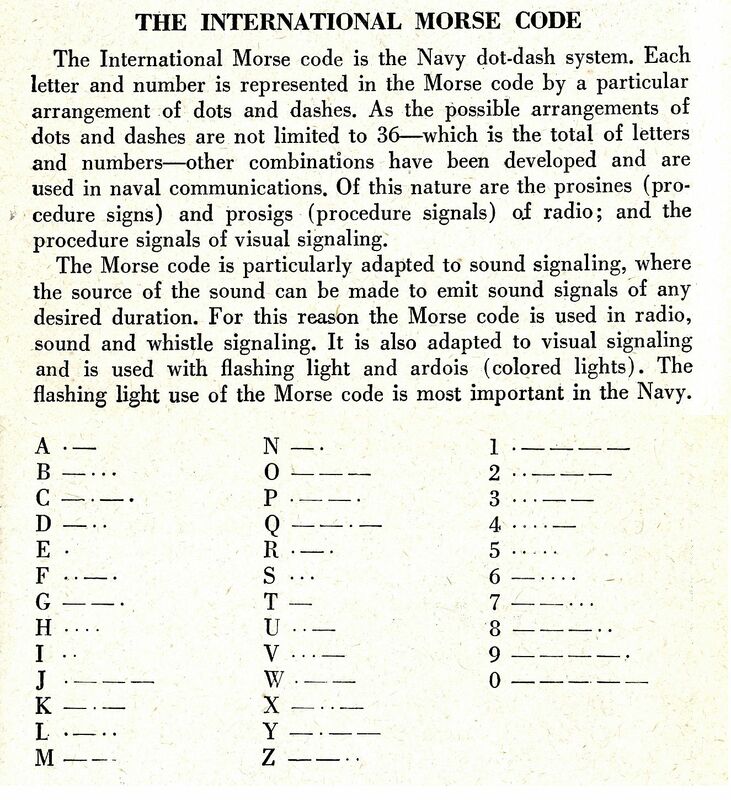 Must be familiar with the parts of Naval messages, including abbreviations and shortcuts (prosines, etc. ); keeps a radio log. Stands watch in radio "shack". EQUIPMENT USED: Radio telegraph, radio telephone, direction finder, typewriter. Radio repair tools, electrician's tools, testing meters. TYPES OF BILLETS: All ships; radio stations ashore. RELATED CIVILIAN OCCUPATIONS: Radio operator, transmitter operator, wireless operator, telegraph operator. 19 weeks. Practice in sending and receiving Morse code, typing, and hand printing. Naval radio operating procedures. Practical instruction in use of radio instruments and radio-type equipment. along with an "Intersting tidbits" section. 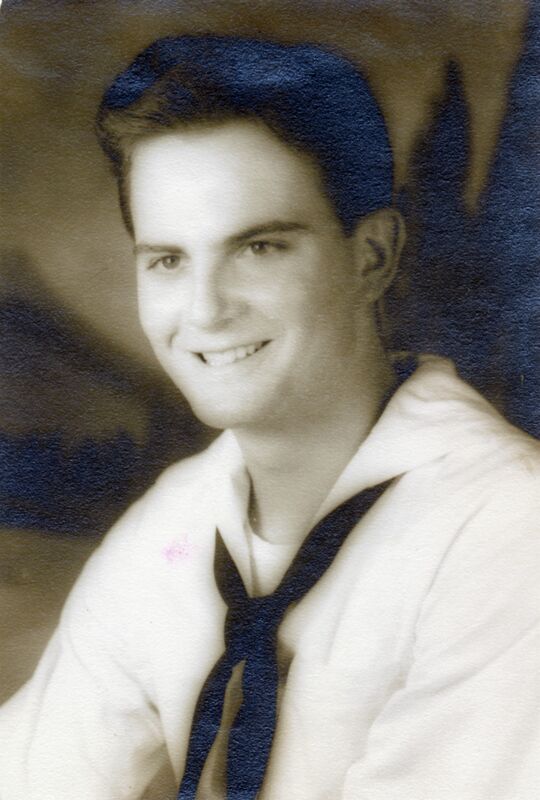 Upon his graduation on Saturday, August 11, 1945, Frank had attained a final mark of 80.77, was ranked 59th out of the 86 men in his class, and was promoted to Seaman 2nd Class – Radio Man "S2C (RM)".